What's the Roesch? : Let The Baby Gifts Begin! Let The Baby Gifts Begin! Here's a picture of our very first baby gift. Shannon received it as a Secret Santa present at work. 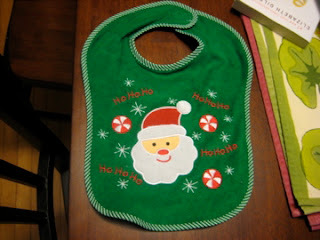 So if you're thinking of a Santa bib, keep your wallets in your pockets because we're all covered. Damn it!! I wanted to be the first one to buy Ruby (that's my working name for baby Roesch) a present, but Jay keeps telling me I have to wait. Now I feel like a bad aunt. Someone else is spoiling the baby before me. Ugh! Being an aunt is hard.